Methinks Lamb doesn’t really master the concept of “dialogue”. Diagnosis: Raging dominionist fundie. At least he hasn’t quite mastered the art of Orwellian subversion employed by so many of his ilk. Just another creepy Jesus freak trying to push his agenda on others. Just say "no" folks! You know, you've featured plenty of climate change denialist loons; since you're coming up on the letter “m,” how about a loon from the opposite end of the spectrum. 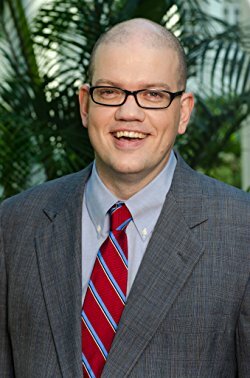 Specifically, one Guy McPherson, whose cherry-picked data PROVES that runaway climate change will render the human race extinct in less than a decade, and any climatologists pointing out the flaws in his ideas are all part of a conspiracy to hide the coming apocalypse from the world.